Flight Scholarships - Aviation Adventures, Inc.
commercial pilot and is fully committed to achieving that goal. She is an active member of the Ninety-Nines and enjoys volunteering at events to help give back to the aviation community. While she is enjoying every step of the journey, she also appreciates the opportunity to inspire the next generation of female pilots along the way. Good luck, Stacie. We know you will do well with your can do attitude! FOURTH ANNUAL MARIE GREIN SCHOLARSHIP 2017: Congratulations to MINDY NYE, winner of the 2017 Marie Grein flight scholarship. From Mindy's essay: "I plan to be a fully certified EMS pilot and become a life flight pilot for Los Angeles Children’s Hospital. In the past, I dedicated my time volunteering at Rady Children’s Hospital. Now I want to continue this unique work with children flying medical missions to save lives. The opportunity to fly and do meaningful work is a genuine passion for me. I’m an enthusiastic member of the 99s, WAI, AOPA, and Whirly Girls. I volunteer at Young Eagles events, attend 99s meetings and participate in FAA Safety seminars. 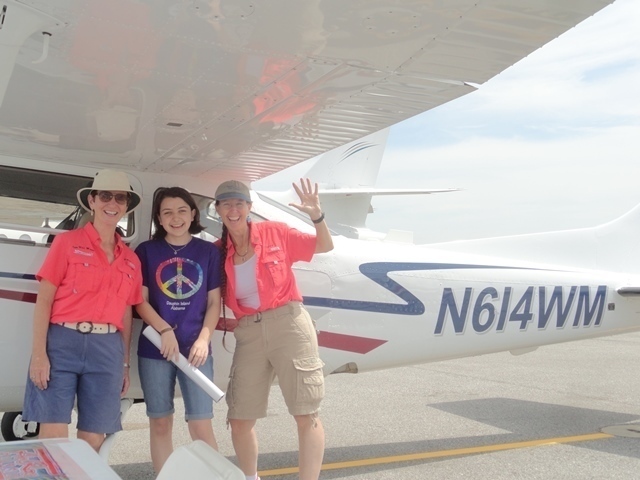 The events that encourage young girls to start flying at an early age have been the most meaningful to me." We look forward to Mindy continuing her volunteer efforts supporting aviation education: a mission so near and dear to Aviation Adventures. Congratulations, again, Mindy! Third Annual Marie Grein flight scholarship. 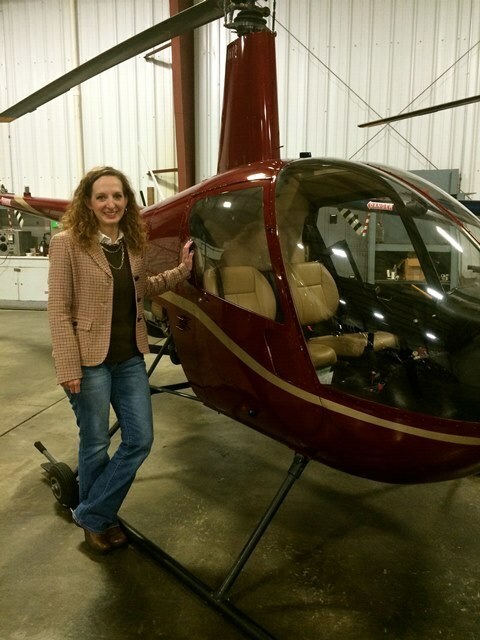 Jennifer discovered airplanes while working for REACH Air Medical Services. One ride and she was hooked. 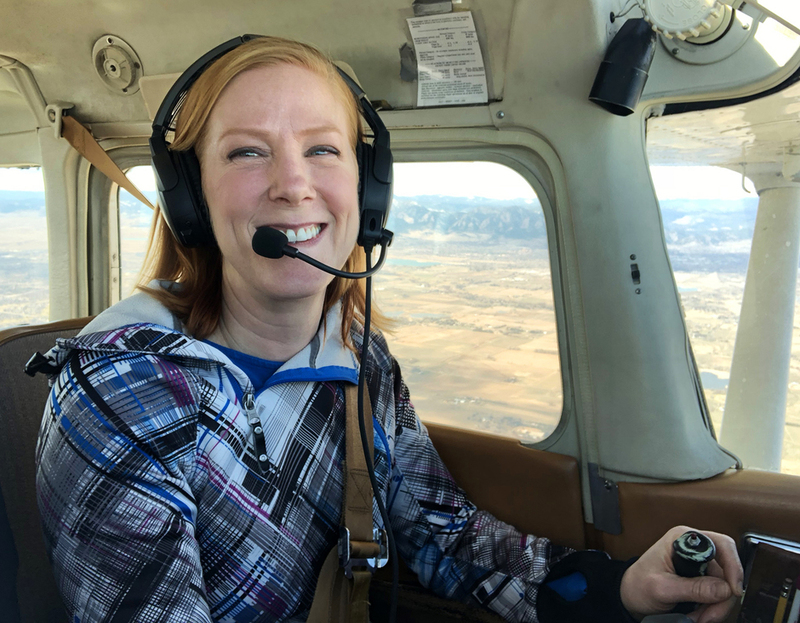 She now remains employed by REACH, while reaching for her dream of earning her private pilot certificate and putting her newly learned skills to work. Best of luck to you, Jennifer. We will wait for up-dates on your progress. Thanks to the generosity of an anonymous donor, Aviation Adventures was able to send one lucky young lady to the National Flight Academy in Pensacola, FL. Lizzie Graham has been a student with the "No Limits Girls Aviation Program" since 2011 and is one of the team leaders for the 2015 program. Awesome job - keep up the good work, Lizzie! Lizzie dreams of being "the first female Blue angel"; and while someone else already claimed that honor, I am sure Lizzie will be the first PERFORMING Blue Angel. She is 16 now and will start flight training soon. second flight scholarship. Congratulations to MELISSA HANTHORN. 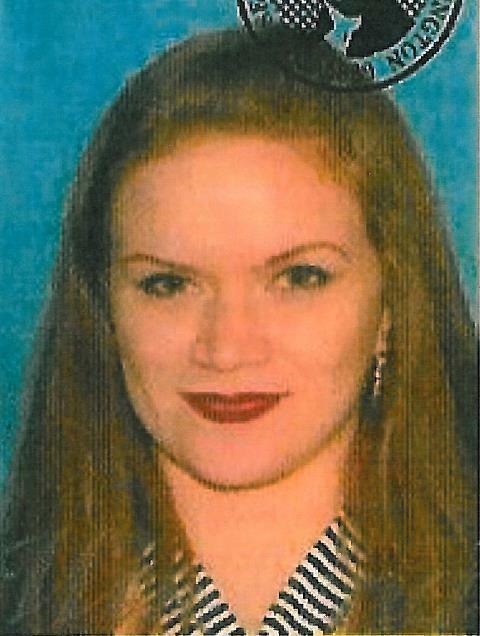 Melissa enrolled in Utah Valley University’s Aviation Administration bachelor’s degree program. She had about 60 hours toward her rotorcraft private certificate and will be looking to make a career our of flying helicopters. 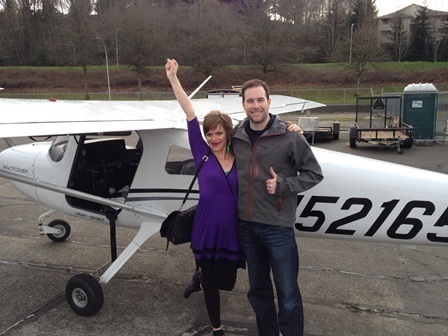 We look forward to hearing all about Melissa flying experiences and will follow her through her private and beyond! 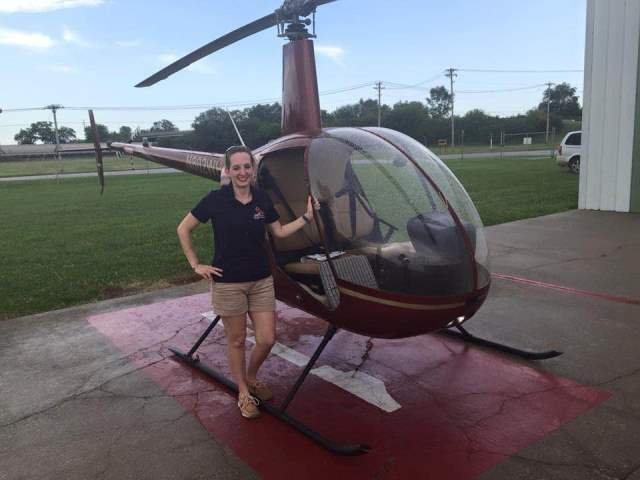 CONGRATULATIONS to Melissa who passed her helicopter private check ride in July 2015. FIRST SCHOLARSHIP AWARDED 2014: Aviation Adventures was blessed to have received a scholarship donation from Florida Suncoast 99s Chapter member, MARIE GREIN. Marie is an active 99s members and believes in "flying it forward". 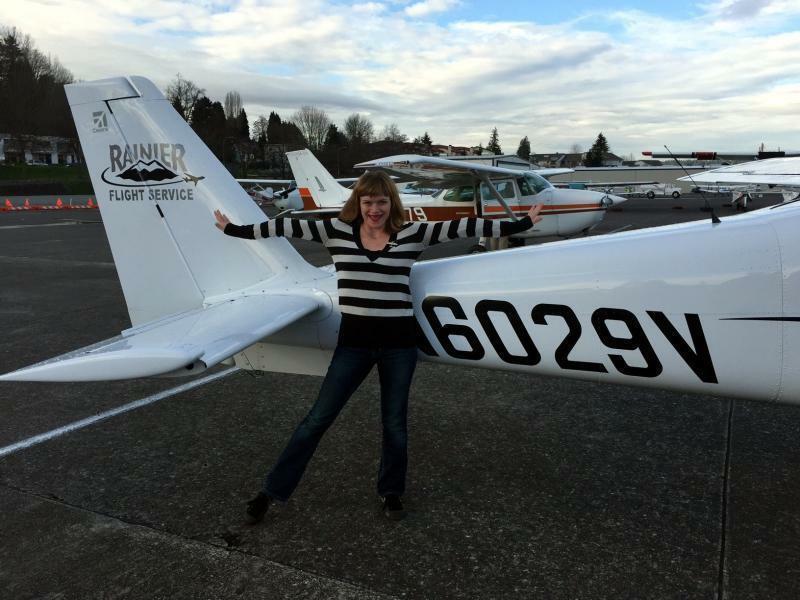 She is the perfect Scholarship Chair for Aviation Adventures, Inc. Registry. Scholarships were open to all 5000 +/- 99s members. Applications were received from all over the United States. 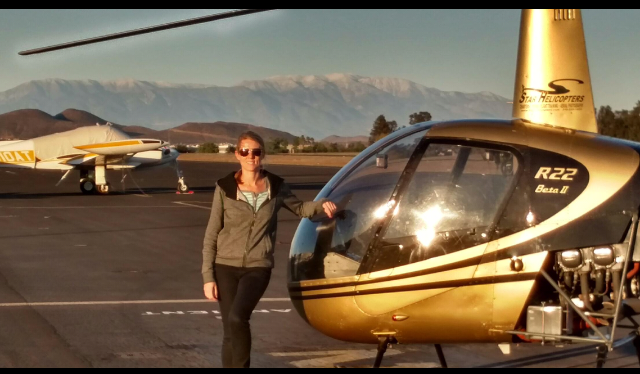 We are please to announce that ALISON GALE LOTSPEICH is the winner for the scholarship for $1000 toward her private pilot certificate. Congratulations Alison. We look forward to reading all about your flight training. I truly cannot thank you enough for what you have done for me and my training. Your selecting me has done so much for my confidence and determination in this venture. I hope that someday I will be in a position to help out an aspiring and deserving pilot in all the ways you have helped me! I knew my first solo was coming soon at the time I sent you my application; then sure enough, a few days later it happened. Training in the Seattle weather, I knew not to get my hopes up too high that day, so I went about my day as usual. But when I got off work, drove across town, and walked in the door at RFS, my instructor Carter looked at me and said, "Well, it looks like a good day to fly solo!" It was so exciting! We went up together, then he had me drop him off. The little plane felt so light without him there, like it could just climb, climb, climb. But I wouldn't let it. I was completely in control, knowing exactly what to do. Exhilarating! I'm sending along some pictures from that day. Two that he snapped of me from the ground, and one of both of us when I came back down! 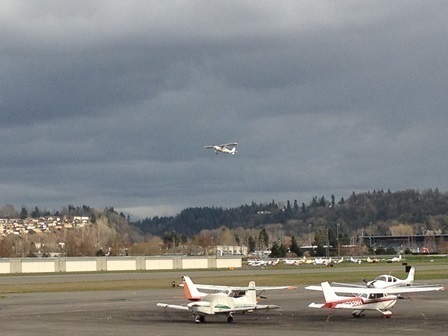 are so happy that our scholarship helped to propel you on your way to your dreams of flight.